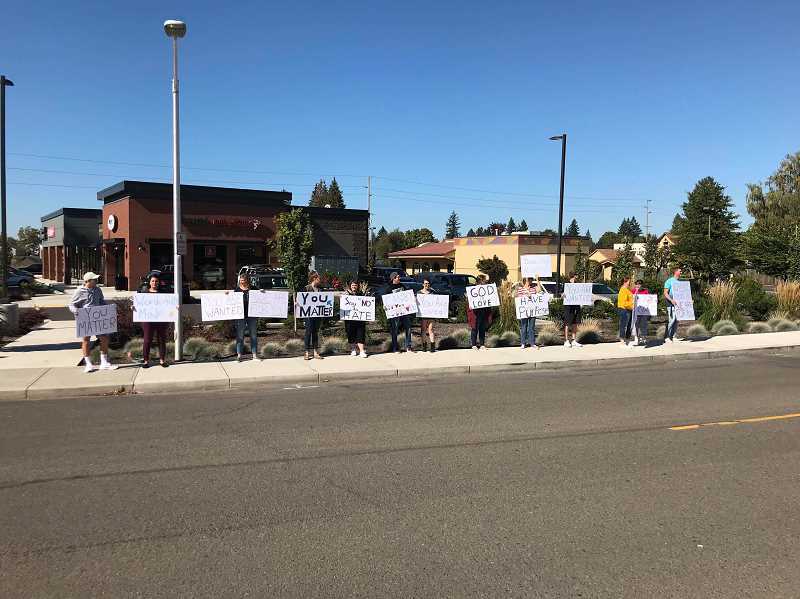 After missionaries showed up at Canby High School on Friday, Sept. 21 holding megaphones and signs with slogans like, "God hates all who sin," some residents and students decided to organize a demonstration of their own. Dylan Erickson works at Dutch Bros. in Canby and is a staff member at Grace Chapel in Wilsonville. He heard about Friday's demonstration through Canby students who came into Dutch that afternoon. "I actually work at Dutch Bros. All the kids come in after school, so on Friday, they all came in and they were really upset," Erickson said. "I am a Christian myself, so I was pretty bummed that that was their view of Christianity." The group responsible, Gospel Invasion Ministries, was in town to preach against a Christian compassion conference. Many students found Gospel Invasion's aggressive approach offensive. CHS student Madison Glenn called it "disgusting," "a disruption" and "ridiculous." "I shouldn't be taught that God hates me," Glenn said. "I am religious and I believe that God loves all of his children." After hearing about the event, Erickson decided to shift the narrative. On Monday, Sept. 24, he brought peers from Dutch, people from Grace Chapel and more to Canby High School with signs of their own, but no megaphones. The signs contained hand-drawn slogans like, "Canby loves you," "You are loved" and "God is love." "It was just about loving students and showing them that we cared," Erickson said, "and that those people on Friday don't represent what most Christians are like." Erickson said students and the community were receptive to their demonstration. "The kids seemed really encouraged," Erickson said. "There was no negative response. Everyone seemed really appreciative, especially the parents. There were people driving by, giving thumbs up."